Umansky Motor Cars | What is it Like to Ride in a BMW i8 Roadster? What is it Like to Ride in a BMW i8 Roadster? Remember the old teen movies with the lead male character driving a roadster convertible? Now you can experience that for yourself with the BMW i8 Roadster. The ride is smooth whether on the road or in Milwaukee. The sounds are impressive, and heads turn at every corner to see what is passing. The BMW i8 Roadster is a hybrid sports car with a 1.5-Liter inline three-cylinder gas motor combined with an electric motor that generates a total of 374-horsepower and accelerates from zero to 60 mph in just 4.4 seconds. The battery is expanded to allow an all-electric trip of up to 22.4 miles and is chargeable through the gas engine and a plug-in capacity while sitting at night. 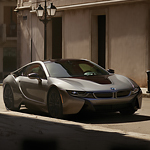 At Umansky Motor Cars, our technicians are certified to maintain the BMW i8 at top performance levels. The entire drivetrain of this impressive machine is checked at every service.